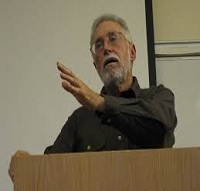 Robin Eric Hahnel (born March 25, 1946) is Professor of Economics at Portland State University. He was a professor at American University for many years and traveled extensively advising on economic matters all over the world. He is best known for his work on participatory economics with Z Magazine editor Michael Albert. Robin speaks to Latin Waves host Sylvia Richardson about the barriers to change moving forward, how not to repeat the failures of the past and how we as progressives need to unite under a common program moving forward if we are to beat Trump. How marching forward under the banner of a “New Green Deal” and “Universal Basic Income” could ignite the imagination of the populace in achieving Justice for the people and saving ourselves from catastrophic climate change. We can have 100 percent employment and a clean healthy environment and we have the know how and expertise already to make it happen, our struggle is one with the fossil fuel industry and their political allies. This entry was posted in Uncategorized and tagged another world is possible, Austerity, author, be the media, community, dispatches, Economics, Flesh Mapping, For the People by the People, Global Economic Crisis, global news, how to listen, international, internet, interviews, itunes, Latin America, latin waves media, media, media democracy, membership, movements, New Green Deal, passion, Peace, podcaster search engine, Podcasting, political, politics, Radical, radio, Robin Hahnel, social change, sound, Stuart Richardson, Sylvia Richardson, syndicated, twitter, Universal Basic Income, youtube. Bookmark the permalink.